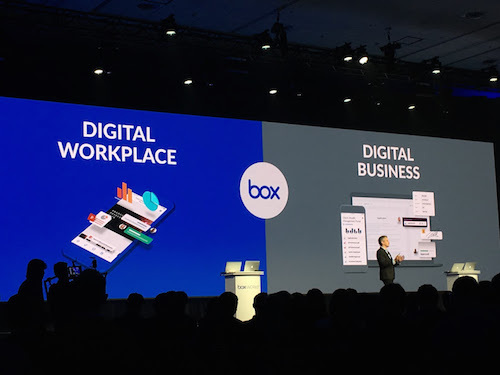 SAN FRANSCISCO – It was a jam-packed session as Box Inc. announced a number of new products and services meant to make it easier for enterprises to use and adopt its cloud-based content management system. Co-founder and CEO Aaron Levie emphasized on stage the need for enterprises to embrace digital practices into workplaces, from an environmental and business practices perspective. He said the quality that successful companies have in common is they were either built as digital from the ground up or have recognized the need to adapt. With a focus on creating digital workplaces and digital businesses and offering products that attempt to support that, the enterprise content management company made six announcements at BoxWorks 2018, including a new integration with Google’s G Suite as well as a new artificial intelligence (AI) beta program partnering with IBM’s Watson. Canada even got a mention on stage when David Kenny, senior vice president of IBM’s cognitive solutions, spoke about how the Alberta Treasury Branches (ATB Financial) was one of the first adopters of Box’s AI toolkit. Box announced at the event that its Skills kit, set to be available later this year, will allow customers to use AI systems such as Watson to create personalized, automated processes for everyday tasks. ATB, for example, is using this partnership between Box and IBM to automate its loan process using Watson technology. 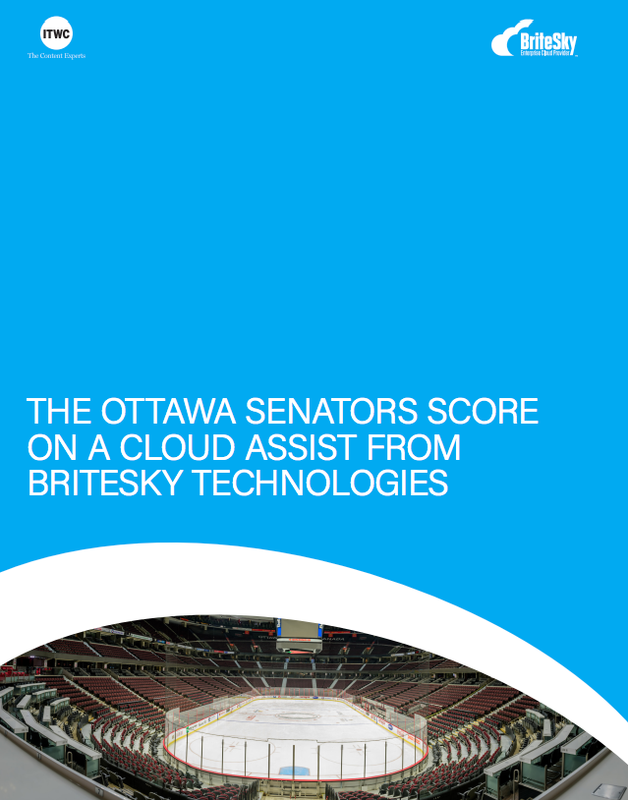 Tyler Yates, senior enterprise cloud management (ECM) specialist at ATB, told IT World Canada that Box was really the only option that met all the company’s needs when it came to choosing an ECM system. “We were impressed at the things we could potentially do with Box, not just store content but make that content work for us,” he said. The Redwood City, California-based company also announced Box Tasks and Automation to allow companies to automate recurring tasks, for example setting a task for a certain employee to review a document. Box also announced it has a new, more in-depth partnership with Google’s G Suite tools that allows customers to use apps like Google Docs, Sheets and Slides right from within the Box platform. One feature that seemed noteworthy was the capability to edit any file between G Suite, Microsoft and Apple tools; for example, the file may be a native Excel file, but a user could edit it in Google Sheets, all without having to re-format or send as an attachment as would normally occur. This integration with G Suite tools also played a big part in ATB’s decision to move to the Box platform, said Yates. It was also announced that the platform will be getting activity streams for files, will recommend apps based on personal usage and will offer Box Feed to curate updates about content that is most relevant and personal to a user. 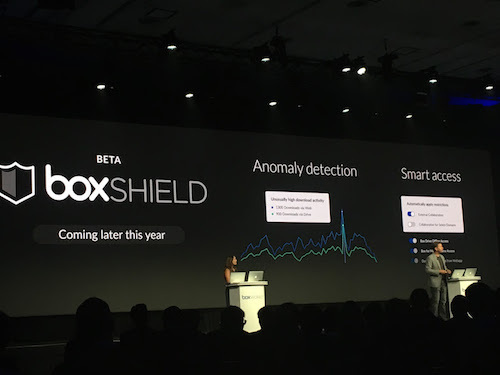 Finally, Box announced a new security feature, Box Shields, that uses AI to detect security breaches and offers clients personalized security based on user behaviour and content needs. He said that’s where Shield comes in, because companies like Box can have a dedicated team that thinks about how to defend a company’s information and can use intelligence to sift through large amounts of data. After a keynote that packed in a lot of information, it appears that the content management platform may have its sights set on creating the workplace of the future.